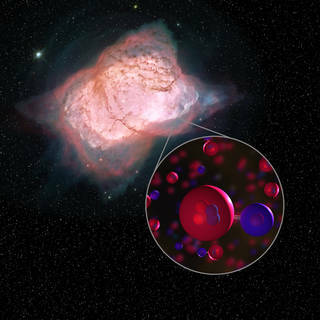 The entire charge and almost entire mass of the atom is concentrated in a single core of the atom is called nucleus and is surrounded by Negatively(-) charged electron clouds. The particle and gold nuclei are so small that they may be treated as a point mass and point charge. The nucleus is considered so heavy that its motion during the scattering process may be neglected. 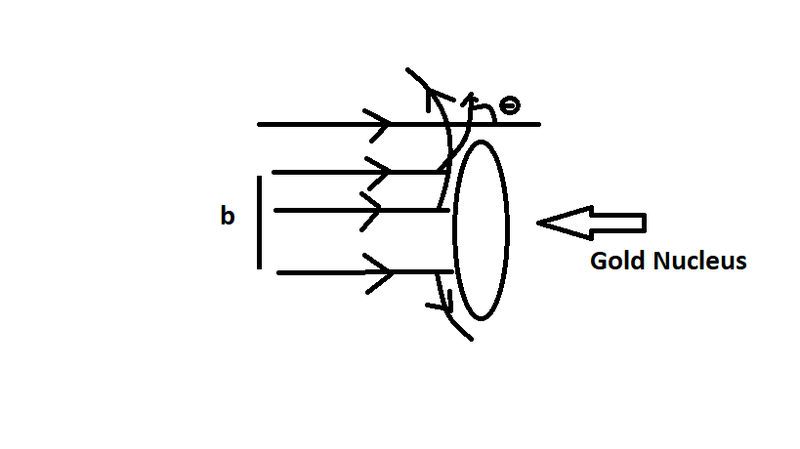 The scattering is due to the coulombs force of repulsion between the particle and the Gold Nucleus. Each particle suffers a single deflection. The particles do not penetrate the nuclear region. So strong nuclear forces are not involved in their interaction. Let an particle is moving along PO apparatus and the relatively heavy nucleus stationary at it. Since both are Positively(+) charged so there is a force of repulsion between them. As particle gets closer to the nucleus the repulsive force highly increases and the particle follows a hyperbolic path. The asymptotes and po and p'o give the initial and final reflection of particle. Let the perpendicular drawn from the nucleus to PO is NM and is the shortest distance between the nucleus and initial direction of 𝞪- particle which is known as impact parameters(b). Z be the atomic no. of the element That scattered particle. Ze be the charge of the nucleus. θ, be the scattering angle or angle of deviation of particle. As the radius joining the -- particle and the nucleus is along the direction of the force. So there is no torque acting on the -- particle. This is the relation between scatting angle and impact parameter. In the actual experiment, a large number of particle are incident various impact parameter all around the (Au) Gold nucleus. According to EQ(5), the particle that approaches the nucleus with impact parameter "b" will be scattered at an angle " "
Consider a thin gold foil of thickness "t" and cross - section "A". Suppose it contains 'n' number of atoms per unit volume, then the volume of the foil is "At". Then the number of target nuclei in the foil is "nAt". We assume that the foil is so thin that particle suffers single deflection i.e , one particle is scattered by one gold nucleus. Since one nucleus has cross - section . So area of cross - section of "nAt" nuclei = . Where N(0) represents the number of particle per unit area striking the screen. This is the expression for Rutherford's Scattering formula. 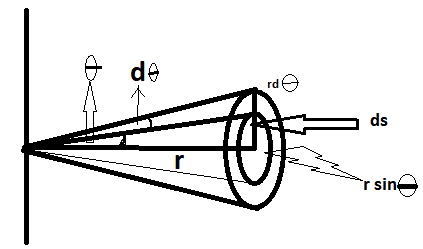 The Theory of Rutherford's Particle scattering was verified by a series of experiments conducted by Gaiger and Marsden in 1913. The experimental arrangement consists of an Airtight chamber (c) which can be evacuated by tube (T). The chamber is capable of rotating inside the jacket ( J ) about a vertical axis. Radon is taken as the Radioactive source Rc of particles Which is placed inside a Radioactive cell (L). 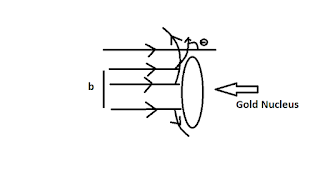 After coming out of the narrow opening lead cavity the particle strikes a thin foil (F) (Gold, Silver, Platinum ).The foil is placed at the centre of the chamber (c).The scattered particles are viewed through low Power Microscope (M) which is provided with a fluorescent screen. As the chamber rotates about a central axis the microscope rotates along with it but the cavity (L) and foil(f) remain fixed with the tube. The particles striking on the foil get scattered in a different direction. The number of particles scattering along different direction can be recorded by observing the scintillations on the fluorescent screen. Most of the particle either passed straight through the metal foil or suffered only small deflection. This could be explained by Thomson's Atomic Model. which is perfectly agree with the theory. 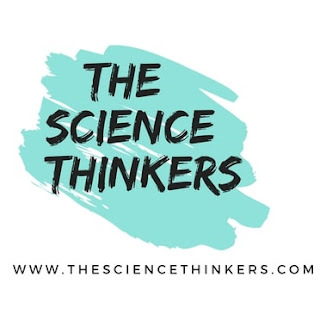 4.If "t" is the thickness of the foil and N is the number of particles scattered along scattering angle , It was observed that .This agreed with the theory. Let an particle having velocity approach a nucleus (head on) having a charge (+Ze). The velocity of particle decreases till it comes to rest at a distance "b" from the nucleus.It is the then repelled back along the direction of approach. by putting the value of m,v and Z for given experiment we can find the radius of given nucleus. Mass of particle M= , Then what is the radius of the nucleus? 1. According to electromagnetic theory, a charged particle in accelerated motion must radiate energy in the form of electromagnetic radiation. As a result, there should be a gradual decrease in the energy of the electron. The electron should follow a spiral path and ultimately fall into the nucleus. thus the whole atomic structure should collapse. this is contrary to the actual fact that atom is very stable. 2. According to Rutherford's mode electron can revolve in any orbit, So it must emit continuous radiation of all frequencies but elements emit spectral lines of only definite frequency.